The Alternative Manure Management Program helps dairy and livestock producers decrease their manure-derived methane emissions by transitioning from one manure management system to another. It does not provide funds for the installation of an anaerobic digester. It awards funds up to $750,000. Install a mechanical screen separator that separates manure solids from flush water. Compost the manure in windrows on concrete and recycle the flush water. Spread the compost on his pastures, increasing pasture time and decreasing the amount of manure in the barns. Build a compost pack barn for his heifers. 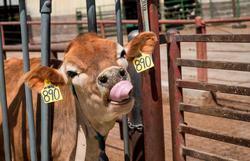 Jerry DaSilva in San Joaquin County received an AMMP grant for his dairy. He will install “weeping walls” to separate manure solids from the water used to flush his barns. After drying on concrete pads, the manure will fertilize his fields. In addition to cutting methane emissions and reducing nitrate leaching into groundwater, this new system requires less labor than the previous one. By separating the manure from the flush water, these recipients will significantly decrease their methane emissions. It is helpful to obtain the necessary permits and quotes for projects before starting the application, as you will need them to complete the application.